Get the best results in the fastest possible time. The renude Laser Tattoo Removal Clinic in Lane Cove, Sydney offers the world’s first free pre and post treatment for tattoo removal using Cold or Low Level Laser to improve your tattoo removal outcomes and reduce your discomfort. There is no heat just healing light. Our clinic in Sydney is equipped with state of the art Q-switched laser and Low Level Laser Technology (LLLT) which is able to remove all tattoo colours in fewer treatments and with less discomfort. Watch our short video on how renude offers laser tattoo removal that is faster, safer, healthier, less painful and effective on the full spectrum of colours. renude Laser Tattoo Removal clinic in Sydney uses the Quanta Q-Plus C laser machine due to its superior ability to remove multi-coloured tattoos with ease and far less discomfort. Successful tattoo removal is dependent on the location, skin type, colours, the amount of ink/layering, presence of scarring and the immune system. To achieve faster tattoo clearance times, renude laser clinic is the only laser clinic in Australia to combine laser tattoo removal with Low Level Laser Therapy (LLLT) as part of our pre and post treatment plan. Laser tattoo removal clinics can vary widely in their quality and results achieved for clients. 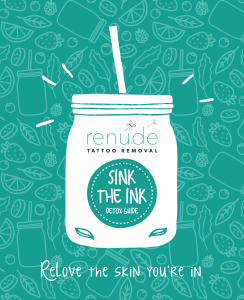 Renude is a specialist laser tattoo removal practice that offers an unparalleled level of care and state of the art technology in Lane Cove, Sydney. With over 25 years in the health care industry, we continually invest in the latest laser technology to help our clients achieve removal of all tattoo colours in the fastest possible time with the least amount of discomfort. Dr Catherine MacInnes leads a team of tattoo removal clinicians experienced in the use of Q-switched lasers and are achieving outstanding tattoo removal results for clients. We believe that an informed client is the best client. It’s our job to provide you with the most current information in the world of tattoo removal and healing. What do I need to do to take care of my skin? If there’s anything we haven’t answered, we are here to help so feel free to call us on 1300 125 327 or contact us by email. The health of your lymphatic system determines how quickly your tattoo will be removed. This guide from renude Laser Clinic gives you practical tips on how to get your system moving so you can ReLove the skin you’re in! I was stoked at the results achieved in just 6 sessions. The guys at renude really know their stuff. I had such a bad experience elsewhere. These guys turned it all around. V happy! I am finally free of an embarrassing tattoo that I’ve hated for ages. I still like my other tats but would recommend renude to anyone. Great job guys, thx!